Lack of suitable analytical software and computational power constrains the comprehension of animal movement. In particular, we are aware of no tools allowing simulating spatially-explicit multistate Markovian movements constrained to linear features or conditioned by landscape heterogeneity, which hinders movement ecology research in linear/dendritic (e.g. river networks) and heterogeneous landscapes. SiMRiv is a novel, fast and intuitive R package we designed to fill such gap. It does so by allowing continuous-space mechanistic spatially-explicit simulation of multistate Markovian individual movements incorporating landscape bias on local behavior. We present SiMRiv and its main functionalities, illustrate its simulation capabilities and easy-of-use, and discuss its limitations and potential improvements. We further provide examples of use and a preliminary evaluation, using real and simulated data, of a parameter approximation experimental method. SiMRiv allowed us to generate increasingly complex movements of three theoretical species (aquatic, semiaquatic and terrestrial), showing the effects of input parameters and water-dependence on emerging movement patterns, and to parameterize a high-frequency simulation model from real, low-frequency movement (telemetry) data. Typical running times for conducting 1000 simulations with 10,000 steps each, of two-state movement trajectories in a river network, were of ca. 3 min in an Intel Core i7 CPU X990 @ 3.47 GHz. SiMRiv allows simulation of movements constrained to linear habitats or conditioned by landscape heterogeneity, therefore enhancing the application of movement ecology to linear/dendritic and heterogeneous landscapes. Importantly, the software is flexible enough to be used in linear, heterogeneous, as well as homogeneous landscapes. Using the same software, algorithm and approach, one can therefore use SiMRiv to study the movement of different organisms in a variety of landscapes, facilitating comparative research. SiMRiv balances ease and speed with high realism of the movement models obtainable, constituting a fast, powerful, yet intuitive tool, which should contribute exploring several movement-related questions. Its applications depart from the generation of mechanistic null movement models, up to population level (e.g. landscape connectivity) analyses, holding potential for all fields requiring the simulation of random trajectories. 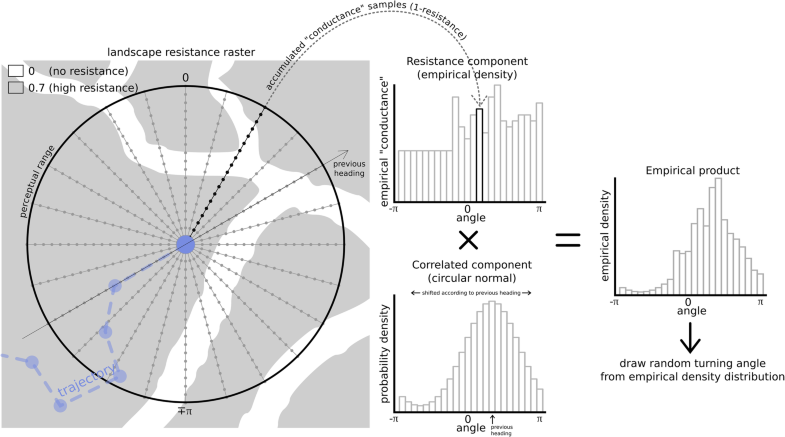 Scientists in a variety of fields often rely on simulations of random trajectories to make inference on the movement of organisms or cells e.g. [1–7]. In the burgeoning field of Movement Ecology, for instance, the generation of random trajectories is often the base for developing home range/movement models e.g. [3, 5], and assessing connectivity [7–9], site fidelity  and habitat selection . Despite the availability of various ecological software simulating movements [11–16], we are aware of no available tools allowing spatially-explicit simulation of Markovian multistate correlated random walk movements constrained to linear features (e.g. 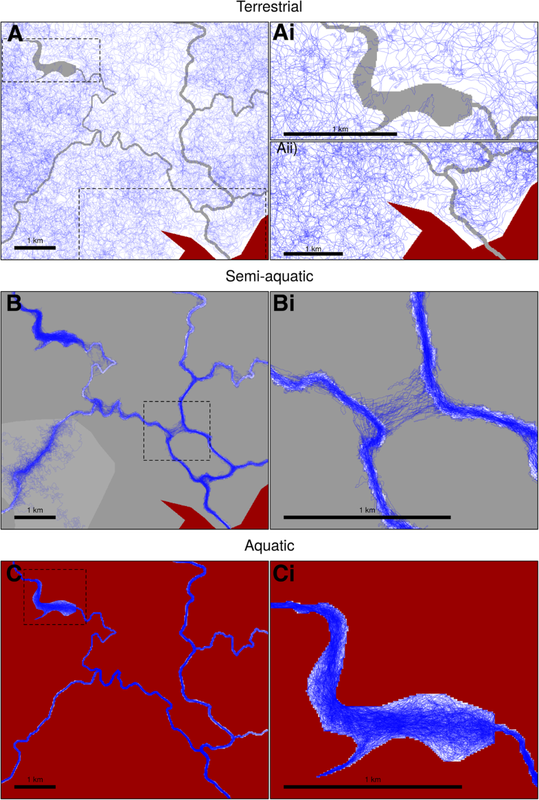 rivers and other dendritic ecological networks – DENs  – as well as roads) or incorporating landscape bias. Thus, movements simulated using available software are not properly comparable with real movements of organisms moving in linear or heterogeneous landscapes, and therefore not suitable to be used as null models, hindering the testing of hypotheses on the mechanisms underlying movement behavior in non-homogeneous landscapes. The highlighted lack of software might help explaining why individual-based movement models commonly used in ecological research so far have rarely been applied to freshwater DENs, compared to the number of studies focused on marine and 2-dimensional landscapes e.g. [18–21], possibly due to the analytical challenges imposed by DENs’ spatial configuration cf. [22–24], and focused more on homogeneous, featureless [25, 26] or largely homogeneous  landscapes. Similarly, while robust testing of site fidelity has been performed for organisms living in homogeneous, terrestrial landscapes e.g. [6, 27], similar studies in freshwaters have been simpler in their nature e.g. . Thus, the deep comprehension of animal movement in linear (e.g. river networks) and secondarily heterogeneous landscapes remains limited. SiMRiv is a novel free, open-source and user-friendly software (R package) for continuous-space mechanistic simulation of spatially-explicit, multistate (Markovian) individual movements incorporating landscape influence on local behavior, which we conceived to fill the highlighted software gap. SiMRiv so far allows simulating simple or composite random walk (RW) and correlated random walk (CRW) movements [29, 30] locally biased by landscape heterogeneity or constrained to specific landscape features (e.g. rivers). Hence, it allows simulation of movements of any organism in any landscape, including river networks. 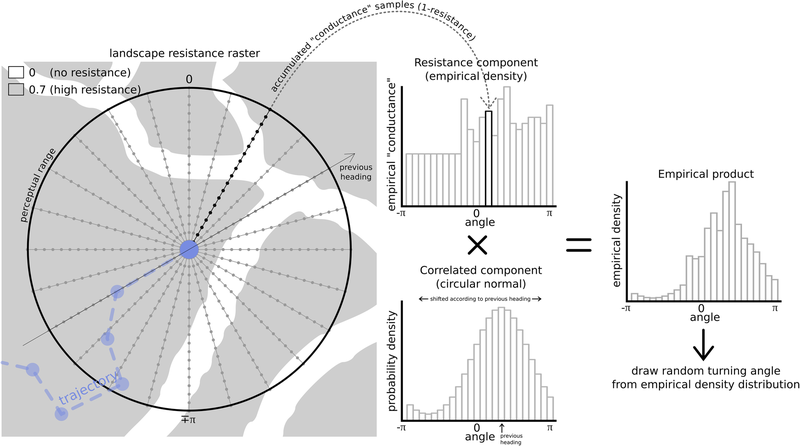 SiMRiv’s approach focuses on parameters with which researchers are already familiar, like landscape resistance layers, step length and turning angle (i.e. the distance and the angle between two successive locations, respectively). The influence of landscape resistance on animal movement and connectivity is a well-known and consolidated field of research e.g. [31, 32], as is the use of the step length and the turning angle in Movement Ecology e.g. [10, 29, 33, 34]. SiMRiv may be used as a process-based, mechanistic [3, 35, 36] movement simulation tool enabling simulation-based null model  hypothesis testing, as well as for population level analyses e.g. . 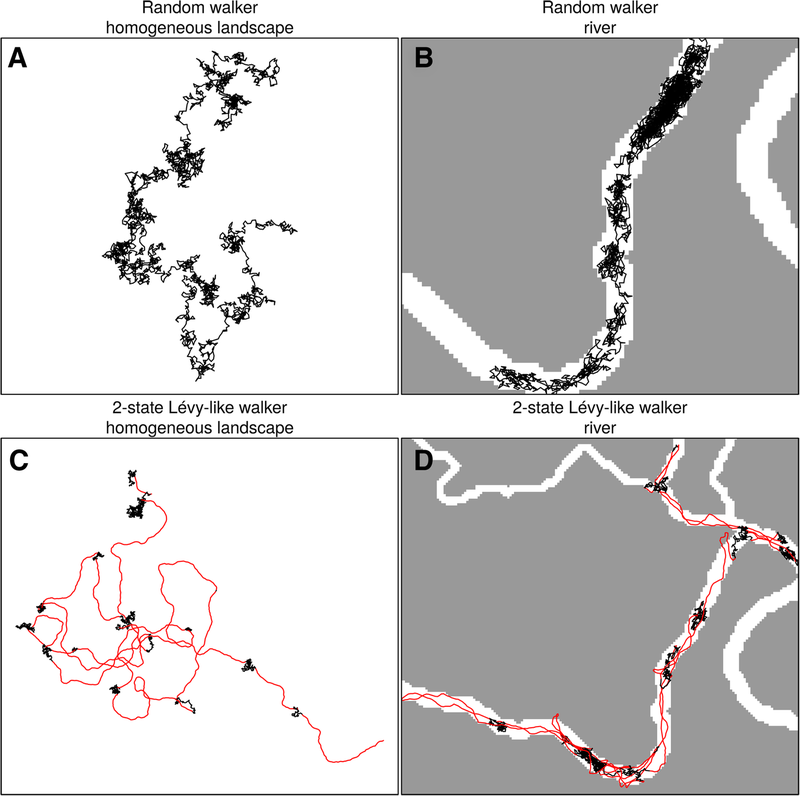 Here, we summarize the main novelties and functionalities of SiMRiv, illustrate software capability to simulate complex animal movements in linear, homogeneous and heterogeneous landscapes, show the effects of varying input parameters and animal behaviors on emerging movement patterns, and provide examples of use of the software. In addition, we provide a preliminary evaluation, using both real and simulated data, of an experimental method for parameterizing the simulation model from real (observed) data. One of SiMRiv’s primary features, and the main reason for which it was originally designed, is the ability to simulate movements in linear/dendritic (e.g. river networks) or heterogeneous landscapes - i.e. landscapes where the organism has varying degrees of permeability/affinity to distinct landscape features. Such spatially explicit permeability/affinity is emulated by the concept of “landscape resistance”, reflecting the willingness of an organism to cross a specific environment and the physiological cost of moving through it . The pixel values of the user-provided resistance raster dictate how much the animal is attracted to or repelled by that pixel, and how difficult it is to move within it. At the most extreme case, the resistance raster may consist of only 0 s (no resistance) and 1 s (infinite resistance), which is adequate, for example, to simulate a fish in a river. At the other extreme, simulations may be conducted without any raster, i.e. in a homogeneous space, as in previously available software. All intermediate situations are nevertheless possible. Move to new location defined by the drawn angle and the actual length of step. Plots the evolution of the optimized solutions (sets of input parameters) along the generations of the optimization algorithm during input parameter approximation to real data. Defines the perceptual range to be used in a behavioral state. Resamples a simulated movement to a lower temporal resolution and computes step-wise statistics of turning angle, step length and accumulated resistance. Performs fast and spatially-explicit simulation of multistate random movements of individuals in an optional landscape resistance raster. Creates a species to be simulated, characterized by one or more behavioral states and the respective transition matrix. Defines a species model for which to adjust parameters based on a real trajectory, during the optimization performed by ‘adjustModel’. Defines a behavioral state to be used when defining species. Creates a resistance raster to be used in simulations, by rasterizing and combining different shapefiles. Defines the state transition matrix, i.e. the probability of the individual switching from each behavioral state to another in each step. To allow trajectories of simulated animals to properly respond to the environment, including to be constrained to linear landscapes or influenced by landscape heterogeneity, SiMRiv was designed so that movements have to be simulated with a very high temporal (and therefore spatial) resolution - possibly higher than that of many real field datasets. In this way, the behavior of the simulated animal (i.e. its realized turning angles and step lengths) is adjusted based on its context at every location in a quasi-continuous manner (Fig. 1), i.e. it makes context-based local decisions of which direction to follow at each step. SiMRiv simulations may therefore be described as multistate, locally-biased (correlated) random walks. For the simulation algorithm to work properly, the simulated steps should be small in relation to landscape features, as the more frequently the behavior is updated, the better the landscape bias is incorporated in the movements. In particular, care has to be taken to ensure that the simulation realized step lengths are shorter than the smallest/thinnest landscape features, as this would result in the animal “skipping” portions of the landscape. To better control this, we simplified the step length input parameter to a fixed number (for each movement state) e.g. , with which the user defines the maximum allowable step length, instead of regarding it as a distribution from which random values are drawn in each step e.g. . As a rule of thumb, we recommend the maximum step length to be set at most half the size of the smallest/thinnest landscape features. The realized step length distribution is therefore truncated in its upper limit, but this effect is minimized after downsampling simulations to a coarser frequency, similar to that of most real data see . The effects of this simplification are outweighed by the flexibility of combining multiple basic movement types (Random Walk, Correlated Random Walk or Resting), thus generating compound movement types of any complexity (see below and Fig. 1 and Additional file 3: Figure C.2). The locally-biased and high-frequency approach here presented should confer realism and high flexibility to the behavior of simulated organisms. Besides, it avoids unrealistic assumptions, such as animal omniscience and planned final destination, generally found in the least cost path (LCP) modelling approach (see also [8, 22]). These and other benefits are further illustrated in the Additional files 3 and 4, and . Table 1 and Additional file 4 synthetize SiMRiv’s main functions and differences with other similar packages, respectively. Additional file 5 provides a detailed description of SiMRiv basic simulation workflow. To simulate, users might set the input movement parameters according to available literature or expert-based criteria, or estimate them from real (telemetry) data. As SiMRiv simulates at a higher time frequency than most of real data, the statistical methods conventionally used for estimating input parameters, either bayesian e.g. [20, 39, 43] or maximum-likelihood-based e.g. [16, 44], are rather challenging to apply . We are currently working on the development of a maximum-likelihood estimation method for parameterizing the simulations from real data. For now, we include a provisional function (adjustModel, Table 1) to approximate input parameters from real data through a pattern-oriented approach (see below). This function is built upon a consolidated heuristic numerical optimization algorithm, the genetic algorithm NSGA-II , which we programmed to solve the particular problem of finding simulation input parameters for simulations conducted at a possibly much higher frequency than the provided real trajectory. This function allows SiMRiv users to parameterize the high-frequency simulation model from real, low-frequency movement (telemetry) data, following a Pattern-Oriented modelling (POM) approach , aimed at maximizing the closeness of models to real data  – i.e., here, to uncover what kind of real complex high-frequency movement could have produced the observed low-frequency sample. As of current version, the function uses by default the differences in turning angle and step length distributions as metrics to quantify how similar are the simulated and observed tracks, such that during parameterization, the algorithm minimizes these metrics. However, there is room for improvement in this respect, as these two metrics lose many details that are important to characterize a trajectory. In Additional file 3 we provide a detailed explanation of this method, including a preliminary evaluation of its performance, using examples with both simulated (known) and real data, and discuss advantages and limitations of it, and how we plan to improve it. Originally conceived to allow simulating in river and other DENs, SiMRiv’s simulation algorithm was designed to be highly flexible, being applicable to any organism (aquatic, semiaquatic or terrestrial), regardless of its space use patterns (linear, omnidirectional or their combination). Here, we demonstrate SiMRiv’s capabilities to simulate increasingly complex movements and varying input parameters. First, we show two types of movement, both simulated in a homogeneous and a linear (e.g. river) space (Fig. 2), illustrating SiMRiv’s ability to provide biologically-plausible null movement models for species occurring in homogeneous habitats and in river networks. Second, we show the effects of varying landscape resistance values on resulting simulated movements (Fig. 3). For this, we simulated two-state movements of three theoretical species along a gradient of water-dependence (terrestrial, semiaquatic and aquatic). The three species were defined by the same set of input parameters, except the resistance values assigned to the different habitat features of the landscape in which they move. SiMRiv was able to generate movements akin of the classical Lévy walk e.g. [48, 49] of a species moving nearly homogeneously in a bi-dimensional space (Fig. 3a), as well as movements with the same Lévy walk properties but strongly influenced by landscape resistance, in this case partially (Fig. 3b) and totally (Fig. 3c) constrained to river networks. Third, we show the effects of different perceptual range values. For this, we simulated movements of a theoretical semiaquatic species with 500, 2000, and 5000 m of perceptual range. Increasing perceptual range resulted in a decrease of species confinement to the water network and an increase in out-of-network movements, mostly to shortcut river meanders or to cross from one habitat patch to another (Additional file 2). Also, simulated animals with larger perceptual ranges were more attracted towards larger habitat patches and spent more time there (Additional file 2.A, Additional file 2.B). Conversely, there was an increasing tendency for small scale features to attract/repel the animal in detriment of large features, as perceptual range decreased (Additional file 2.C). Thus, under our model, although not explicitly included in simulations, patch size has an influence on both animal affinity/repulsion towards a patch, as well as the time the animal spends in it . Such influence of perceptual range on species movements may have important implications in the estimation of habitat connectivity cf. . However, and although further testing is needed, based on our preliminary trials it seems that the perceptual range only affects the generated movements when varied of several orders of magnitude, as varying it of only from e.g. 100 to 200 m yields very similar results (not shown). Additional file 3 provides further examples of movements generated by SiMRiv. One of main SiMRiv’s potential uses is the generation of increasingly complex movements incorporating landscape effects, which could then be used as null models to test explicit Movement Ecology hypotheses  under a process-based, mechanistic null model framework. For instance, to assess the potential effects of landscape features (e.g. resources, roads, dams) (or their implementation/removal) on animal movement e.g. , researchers could use SiMRiv to simulate movements with and without the putative influence of the landscape feature/s of interest, by defining different values of affinity/repulsion (or indifference) for the landscape feature/s, and then compare the simulated movements with the observed movements. Such comparisons could be achieved using any metric quantifying the differences between the distributions of movement parameters (e.g. the Wasserstein distance between the simulated and observed step length and turning angle distributions) or directly comparing the spatial overlap of real and simulated trajectories (e.g. through kernel density estimates). Similarly, researchers could use SiMRiv to generate movements to be used as null models to test site fidelity. Finally, despite the individual-based origin, SiMRiv can also be used for analyses at population level, e.g. to assess connectivity - in  we provide an illustrative example using SiMRiv to predict road kill risk, discussing SiMRiv’s potentialities for connectivity research] - and, after future improvements (see Additional file 1), test for interactions. Additional file 6 provides further examples of potential uses of the software. SiMRiv fills the highlighted software gap by allowing simulation of movements in linear and heterogeneous landscapes. Importantly, SiMRiv simulates movements by accounting for local conditions - i.e. the behavior of the moving object is re-evaluated at each step, accounting for landscape effects within the perceptual range - rather than global ‘optima’ used in other approaches, such as least cost-path based analyses see . The software is flexible enough to be used in linear, heterogeneous, as well as homogeneous landscapes. SiMRiv should thus significantly contribute to the study of animal movement, allowing its users to study the movement of different organisms in a variety of landscapes using the same software, algorithm and approach. Finally, SiMRiv’s simulation times are rather fast and the simulation workflow simple to understand and intuitive to use, facilitating its use among biologists. SiMRiv thus constitutes an important tool complementing existing approaches and providing a different way of addressing movement ecology and landscape ecology questions (see Additional file 4: Figure A9). The package is freely available under Open Source GNU GPL 3 license on CRAN, and its development version and code on Github. To install SiMRiv, select the repositories CRAN and then type: install.packages (“SiMRiv”). We welcome feedbacks, bug reports, and collaborations. Further information on SiMRiv’s functions and potential use are reported in the package’s manual and vignette. Other requirements: R 1.8.0 or higher; raster (R package). License: e.g. GNU GPL v3.0. We thank Erida Gjini, Théo Michelot and Henrique Pereira for fruitful discussions on the methodology, Daria Siciliano for the English review, and three reviewers for their useful comments. The authors had no specific funding for the research reported. The R scripts to generate the simulated data, run the analyses and produce the plots are available in the Additional files 7-8, as well as in the Github repository. Additional references cited in the Additional files are reported in the Additional file 9. LQ conceived the idea and led manuscript writing; MP code programmed and analysed the data; both authors designed the methodology, read and approved the final manuscript. LQ is an animal ecologist with expertise in stream and mammal ecology, and a strong interest in movement ecology and methods in ecology. MP is an ecologist, more specifically a botanist interested in community ecology, and a programmer. After noting the lack of software allowing to simulate trajectories in linear habitats (e.g. rivers), which is a pre-requisite to study the movement ecology of organisms, such as semiaquatic mammals, mostly moving within river networks, LQ sought to develop a (free) software to fill this gap. The meeting with MP provided the perfect opportunity. LQ and MP now hope that their software will contribute to the development of the movement ecology research, particularly in linear and heterogeneous landscapes, and seek feedbacks and collaborations to enhance software potentialities. Allen CH, Parrott L, Kyle C. An individual-based modelling approach to estimate landscape connectivity for bighorn sheep (Ovis canadensis) PeerJ. 2016;4:e2001. https://doi.org/10.7717/peerj.2001. Beyer HL. Geospatial modeling environment (version 0.7. 2.1). 2012. URL:< http://www.spatialecology.com/gme.